Pilot wheel pin, sold aboard Greene Line boats, mid-century. Inscription reads: "Greene Line Steamers." Hard Rock Cafe St. Louis sternwheeler pin. 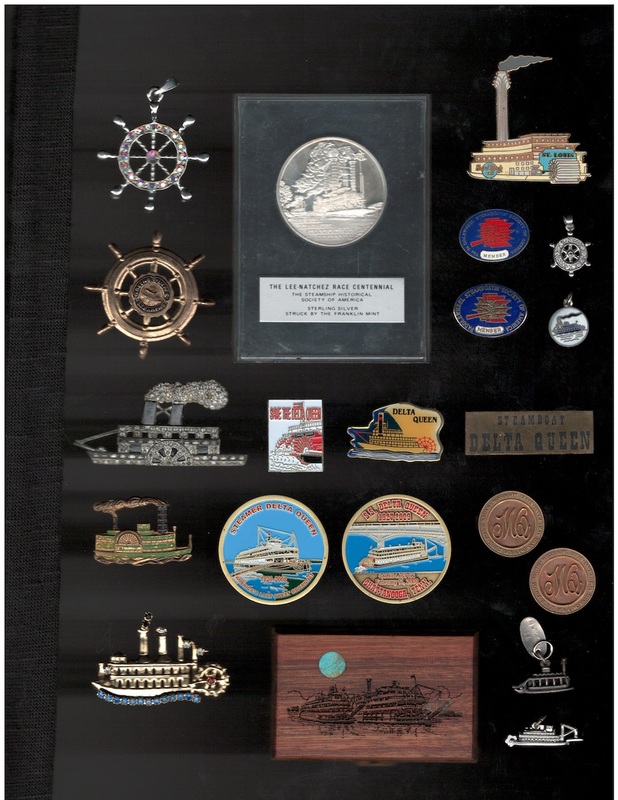 Two blue paddlewheel pins inscribed: "Paddlewheel Steamboatin' Society of America Member." Enamel Delta Queen steamboat charm. Rhinestone sidewheel boat pin, mid-century. Save the Delta Queen pin, minted by John Lewis, fall 2006. Lettering says, "Save the Delta Queen." 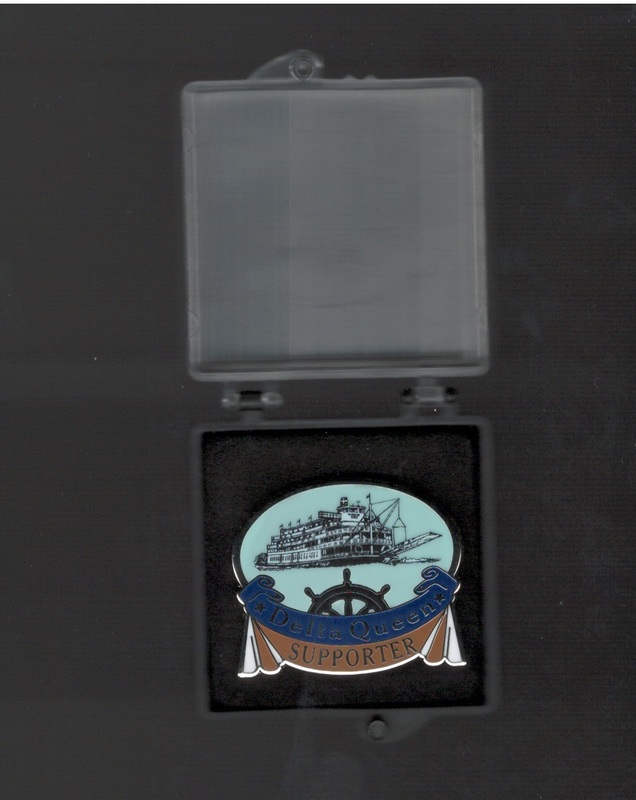 Delta Queen pin, purchased on board the Delta Queen Steamboat, October 2006. Steamboat Delta Queen plaque from the boat. Green enamel sidewheel boat pin, early twentieth century. Steamboat coins, minted by John Lewis. Inscriptions read: "S.S. Delta Queen 1972-2009. Sailed last on February 11, 2009, Chattatanooga, Tenn." and "Help us save the Delta Queen Save a part of America's heritage! As your Congressman to support Bill HR 3852." Mississippi Queen cufflinks. Inscribed: "Mississippi Queen Maiden Voyage July 27, 1976 Cincinnati New Orleans," stamped "14 k."
Metal and rhinestone sternwheeler pin. Delta Queen - Mississippi Queen snuff box. Boat bracelet charm; wheel moves independently, tag reads: "New Orleans LA," stamped "sterling." Boat bracelet charm, wheel moves independently, purchased on the Delta Queen Steamboat, 1996. Contact the Delta Queen Steamboat Company to support the Delta Queen.